In the Bahá’í view, moral development and material development are instrumental in advancing the human race; the basis of moral development is spiritual, the source of spirituality is divine. ‘Abdu’l-Bahá—son of the founder of the Bahá’í Faith, Bahá’u’lláh—explained that "…each of the divine religions is separable into two divisions. One concerns the world of morality and the ethical training of human nature. It is directed to the advancement of the world of humanity in general; it reveals and inculcates the knowledge of God and makes possible the discovery of the verities of life. This is ideal and spiritual teaching, the essential quality of divine religion and not subject to change or transformation. It is the one foundation of all the religions of God. Therefore the religions are essentially one and the same. The second classification or division comprises social laws and regulations applicable to human conduct. This is not the essential spiritual quality of religion. It is subject to change and transformation according to the exigencies and requirements of time and place." In the coming of age of the family of man, the need for moralities is great. Read about the reawakened interest in religion in a publication by the Bahá’í World Centre. The topic "Morality and Spiritual Growth" has a personal focus. The article "The Imperative for Moral Education" makes a case for the renewal of moral development. The topic "Bahá’u’lláh: His Teachings" explores the significance of His message, coinciding with the ebb of humanity’s moralilty and spirituality and yet full of promise. 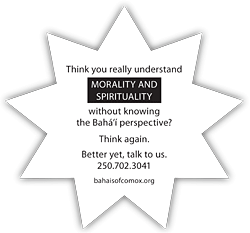 For collaborative study of morality and spirituality and other topics, please call the Bahá’ís of Comox (250.702.3041).